Leisure Arts was kind enough to send me the Easyloop Fauxchet Yarn Tool to try out and review. A great way to crochet and create new patterns! As a crocheter and sometimes knitter this tool was a change in pace to the typical way I crochet but I was excited to give it a try and see how it works. The Fauxchet tool comes with the tool and an instruction book with photos and an easy scarf pattern. The book shows a variety of stitches you can learn along with black and white photos. Since the book and photos are a bit smaller I decided to learn how to use the tool using the Videos found on the Leisure Arts website. If you like to learn from written instructions the book is good but if you are more of a visual person you may enjoy the video instructions more. After removing the Fauxchet out of the package I read through the booklet that suggested that you should use worsted weight yarn when crocheting a project with the tool. After getting my yarn and tool ready, I threaded per the instructions by pushing the yarn up through the right rear needle eye, across the top of the hand and down through the front of the eye. This was easy to do as the book and the video guided me through the process. The next step was to crochet a chain. This took me back to when I was learning how to crochet and figuring out the most difficult after years of crocheting was training myself on holding the tool properly. According to the instructions you are to hold the tool like a pencil, with your thumb holding the underside of the handle and your index finger on the top side of the handle. The next thing to learn is how to maintain your tension on the yarn this just takes a little practice. Once you get started you can easily make your first square. I completed a chain and continue to enjoy using it. Once you get the hang of it and practice a bit with it you can easily make some great scarves, blankets and more items using the tool. 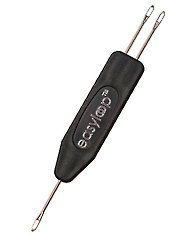 It's probably easier to use this tool if you have crocheted or knitted in the past because you have more of an understanding of the terminology used in the instructions. What really helps are the videos and booklets available to get you started on your new hobby. 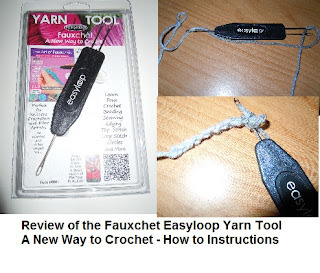 I would give the Easyloop Fauxchet Yarn Tool a Crochet Thumbs up and suggest if you are looking for a new hobby or a fun way to have a new stitch in your collection to purchase the inexpensive tool for your collection and try it out for yourself. You can Order the Easyloop Fauxchet Tool at Leisure Arts. Be sure to check out Fauxchet books and patterns below for more fun ideas! !